ICSM is the major international conference in the field of software and systems maintenance, evolution, and management. This year's theme elaborates on last year's theme of "systems and software evolution in the era of the internet". Standalone legacy applications of yesterday and novel applications using today's technologies are rapidly becoming integrated as part of enterprise-wide and industry-wide systems. The need for rapid integration has led to many distributed heterogeneous systems that are very challenging to maintain and evolve. ICSM 2002 will address these new scenarios and the major challenges on maintenance and evolution. The focus of the conference will be on the new challenges that heterogeneous systems pose for software maintenance, and the new opportunities for researchers and practitioners. A main goal of ICSM is to promote interaction between researchers and practitioners. ICSM 2002 will bring together researchers, practitioners, developers and users of tools, technology transfer experts, and project managers. Jon Pincus (Microsoft) will describe how Microsoft handles software enhancements. Other outstanding Keynote speakers are being arranged. Past conferences have had Parnas, Rombach, McCabe, and Jacobson. 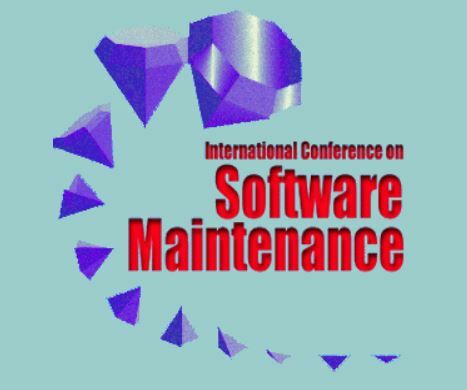 Since its start in 1983, ICSM (International Conference on Software Maintenance) has grown and developed into an international forum for software maintenance researchers and practitioners to examine key issues facing the software maintenance community. Participants from academia, government, and industry share ideas and experiences solving critical software maintenance problems. The ICSM conference is the premier international (world wide) event in the maintenance field. The importance of software maintenance is being increasingly recognised, both in terms of professional activities, and also through public perception, the Y2K problem (Millennium bug) and the Euro-conversion being the most obvious examples. Hence it is vital for the community of researchers and practitioners to publish, present, and debate the latest results in the field. ICSM proceedings present works of outstanding international excellence, where reports on the latest advances in the field may be found. Previous ICSM conferences demonstrated tremendous interest and enthusiasm on the part of both researchers and applications personnel for current work in software maintenance. Many excellent papers were submitted and debated, showing that there is increasing interest in the subject. ICSM is truly an international meeting place for researchers and practitioners in the field. Members of the program committee represent many different countries of the world. Many of the authors of papers also represent the software engineering interests of the international community. A main goal of ICSM is to promote interaction between researchers and practitioners. ICSM 2002 will bring together researchers, practitioners, developers and users of tools, technology transfer experts, and project managers. Remote, tele-work, and co-operative applications. Organizing the program for a major international software engineering conference is quite an experience, and Giulio and I are honored to have been chosen to do so. One's first concern is that the program be leading edge, relevant and interesting. A second concern is that it covers the wide range of topics appropriate to the field. We think we have achieved this, and hope you will agree as you examine the proceedings. To ensure broadness, for the Program Committee we invited 70 internationally recognized experts in software engineering and software maintenance, from every major subcontinent on the planet, including Russia and mainland China, with the unfortunate exception of Africa. (We challenge next year's PC Chairs to make sure Africa gets covered). These experts served not only to help provide visibility for the conference, but worked extremely hard to review all the submitted papers and provide the PC chairs with excellent characterizations of each paper's qualities, the key ingredients to choosing papers for a program. They are listed on the Program Committee page, and Giulio and I offer them our profuse thanks, because they effectively chose the program. The year 2001 was hard economically and September 11 raised strong travel security concerns. This and the size of the PC led us to the unusual decision of having an entirely electronic paper submission, reviewing and choosing process, avoiding the normal difficulty of a full Program Committee physical meeting. We used CyberChair to track paper submissions and reviews, and additionally asked the reviewers of each paper to electronically discuss and recommend the final disposition of the paper for the conference. With very few exceptions, we followed their recommendations. In the usual physical meeting process, a significant fraction of reviewers are not present and the balance attempt to substitute for actual reading of the paper. We think our alternative approach was very effective. Over 127 papers were submitted, from which 61 were chosen for the program, covering an enormous variety of maintenance topics from requirements to design to code to even data. The other major parts of the Program were managed by excellent teams: Industrial applications (Shawn A. Bohner and James R. Cordy), Dissertations (Keith Bennett and Harald Gall), Tutorials (Kostas Kontogiannis Jean-François Girard) and Workshops (Houari Sahraoui and Aniello Cimitile), providing us with 8 Industrial papers, 6 tutorials, and 5 dissertation abstracts. In addition, we accepted 7 short papers that hint at developing technologies of interest. We have coordinated Workshops with software maintenance themes on automated Source Code Analysis and Manipulation, Web Site Evolution, Empirical Studies of Software Maintenance, Database Maintenance and Reengineering Workshop, and Software Technology and Engineering Practice. Lastly, we have invited Keynote Speakers to address aspects of idea of software engineering as an amalgam of people, process and technology. We hope these will provide insight and enjoyment to the attendees. It is an astounding amount of work to set up a program. It would be impossible to do it without the continuous effort of all parties involved, and they should be thanked for their efforts. Ultimately,we only organized the results. One person deserves extra special thanks. Massimiliano Di Penta tirelessly modified CyberChair to make it perform as needed, and additionally kept its data and the website up to date. We wouldn't be here if it weren't for Max. Enjoy the conference. I know we will.